Apple has stepped up its efforts to target enterprise customers through a new partnership with SAP. The companies will deliver native apps for the iPhone and iPad that tap SAP's Hana in-memory computing platform, as well as a new iOS software development kit (SDK). "SAP is the ideal partner to help us truly transform how businesses around the world are run on iPhone and iPad," said Apple CEO Tim Cook. 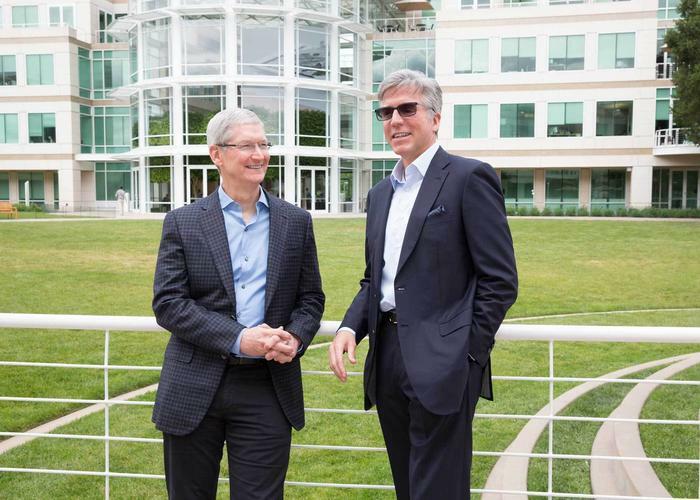 As part of the deal, SAP will develop native iOS apps using Apple's Swift programming language. An app might enable a field maintenance worker to order parts or schedule service, for example; another might allow a doctor to share the latest patient data with other healthcare workers. The new Hana Cloud Platform SDK for iOS will give developers a way to build their own apps that tap core data and business processes on SAP's S/4Hana platform while taking advantage of iPhone and iPad features like Touch ID, location services and notifications. A new design language will combine SAP's Fiori user interface with the iOS experience, the companies said. SAP boasts a global community of 2.5 million developers, and a new SAP Academy for iOS will offer them tools and training. The SDK, design language and academy will begin rolling out before the end of the year, SAP said. The deal is similar to one Apple forged with IBM almost two years ago. By the end of last year, that partnership had brought 100 enterprise apps to market. "We’ll see what comes out of it," said Rob Enderle, principal analyst with Enderle Group, in an email. "This feels like more marketing than anything else." Apple needs to boost iPhone and iPad sales, and "if they can create the impression that SAP runs better on Apple stuff than Google stuff, it would give them an edge over Android," Enderle said. "But enterprise folks really don’t have a lot of say over what phones users buy, and users generally don’t chase offerings like SAP." Enderle worries about Apple's focus. "If they pivot to enterprise, that could be disastrous for them -- their strength has always been a near-rabid user focus," he said. "Their issue is folks are less and less excited about Apple products, and partnerships focused on corporate buyers might actually accelerate that." Roger Kay, an analyst with Endpoint Technologies, wasn't so sure. "Apple's business model is to sell hardware," Kay said. "If they can open up a big new market, that could be pretty important." Kay also doesn't see any reason a new enterprise focus would hurt Apple's image with consumers. "They have so much talent and money, they should be able to handle more than one market," he said.